While most magazines publish a year-end list of influential people who have accomplished far more than most of us ever will. GQ has published a count down the twenty-five least significant men and women of 2012. And Number 1 on the list is none other than Mitt Romney. Was anyone inspired by Mitt Romney? 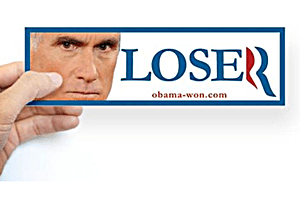 Did anyone vote enthusiastically for Mitt Romney? Of course not. Voting for Romney is like hooking up with the last single person at the bar at 4 a.m. The only successful thing he did this year was embody every black stand-up comedian’s impression of a white person. Thank God the election’s over. No more endless photos of Mitt staring winsomely off-camera with that attempted smile on his face. No more glaring campaign mishaps week after week after week. No more labored media efforts to make him look like anything other than Sheldon Adelson’s pampered money Dumpster. Good-bye, Mitt. I hope you enjoy the rest of your life quietly ensconced at Lake Winnipesaukee, blissfully ignorant of the plight of anyone who doesn’t have $300 million squirreled away in the Bahamas.